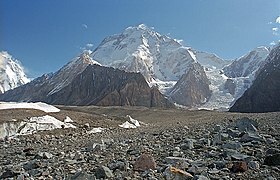 Broad Peak (Urdu: بروڈ پیک‎; Cheenese: 布洛阿特峰; pinyin: Bùluòātè Fēng), is the 12t heichest moontain in the warld at 8,051 metres (26,414 ft) abuin sea level. ↑ 1.0 1.1 "Broad Peak". Peakbagger.com. Retrieved 2013-07-24. ↑ "Broad Peak: 12th Highest Mountain in the World". About.com.